New Low Volume Section at the Shop! 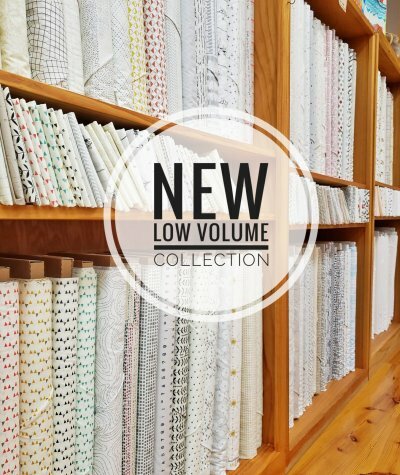 Low Volume: They are those little prints on a neutral background that add scrap-licious flavor to your quilts. Used in place of a solid to spice things up, they range from very subtle, tone-on-tone white, beige and grey to colorful smatterings of pattern. Small whimsical prints are especially fun to play with. Some are modern. Others, more traditional (think civil war shirtings). It really adds excitement to a quilt when you mix them all up; the key is the neutral background of each print. Don't be afraid to use varying tones in the same project! We have a whole NEW section at the Corn Wagon dedicated to low volume prints! You'll find them upstairs near our color wall. We've added a variety of new prints from Art Gallery Fabrics, Moda, RJR and more from designers such as Victoria Findlay Wolfe, and Zen Chic. Stop in and let us help you lower the volume and turn up the interest for your next quilt! Anyone else dreaming of days in the warm summer sun? We sure are and we have the quilts to prove it. Emily Herrick was browsing through the pattern books at our shop when she exclaimed, "Hey! That's my quilt!" 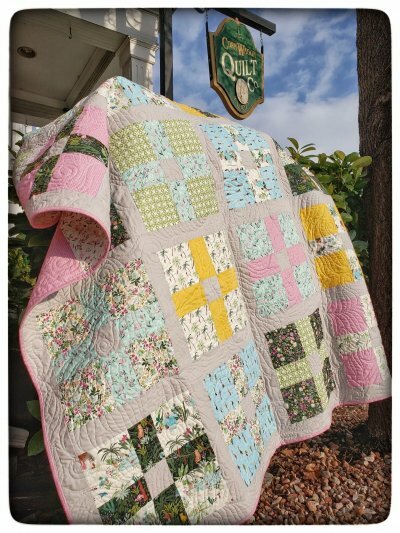 Sure enough, a quilt she designed was included in the pages of Fat Quarter Favorites compiled by Karen Burns (a great pattern book, might I add). 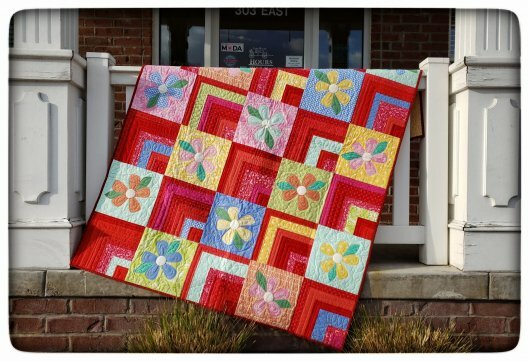 She has since brought in her finished Flower Market quilt for display at the shop and put together kits! Big, bold flowers in a rainbow of happy colors call out, "Summer is coming!" Flamingos and sunbathers swinging in palm trees and swimming in the cool blue make the Paradise City fabric collection from Dear Stella Fabrics as playful as a day at the beach. Janelle Gunderson blended in some perfectly hued basics to make the Positive Effect quilt pattern from allpeoplequilt.com . The pattern is available as a free download on their website! We have kits and more yardage from this positively sun soaked collection. Sneaky peek at an upcoming McCall's Quick Quilts publication in which you'll find another of our machine quilter, Ramona Sorensen's quilt designs! Bejeweled is a quilt that she designed, pieced and machine quilted exclusively for the magazine. She featured a collection of aboriginal inspired prints by Paintbrush Studio in large jewel shaped blocks. The deep indigo background really sets off these unique prints! 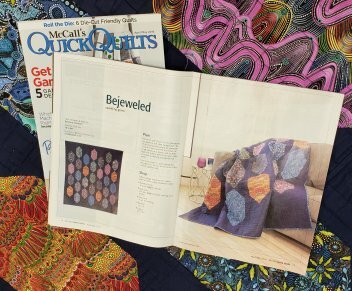 Watch for the latest McCall's Quick Quilts to hit news stands soon! P.S. It's Ramona's birthday Monday (I'm going to need to bring her some good chocolate to make up for telling you this)! You'll notice we included batting in our Marvelous Monday sale in her honor! We sure do love our Mona! Happy Birthday! Here's to a LUCKY weekend filled with happy sewing! 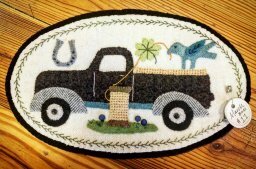 You can pick up a kit for this little 6.5" x 11" lucky truck at our register this weekend and enjoy some wool applique while you wait for spring! Monday, March 18th - 25% off NOTIONS & BATTING! Thursday, March 21st 5:00 p.m. - 8:00 p.m. 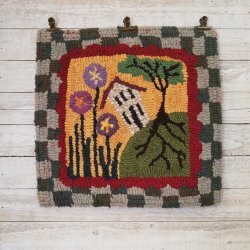 Learn the art of primitive rug hooking while creating one of these beautiful “rugs.” You’ll enjoy learning about this historic craft from our wool expert. Your project can be made into a wall hanging, pillow, table topper, or a rug for the floor. Choose from among a variety of complete kits available in the shop. Register now online or in-store!